Charlotte Bronte found in her illnesses, real and imaginary, an escape from familial and social duties and the perfect conditions for writing. The German jurist Daniel Paul Schreber believed his body was being colonized and transformed at the hand of God and doctors alike. Andy Warhol was terrified by disease and by the idea of disease. Glenn Gould claimed a friendly pat on his shoulder had destroyed his ability to play piano. And we all know someone who has, in solitude, trawled the Internet seeking to pinpoint the source of his or her fantastical symptoms. The Hypochondriacs is a book about mind and body, fear and hope, illness and imagination, despair and creativity. It explores, in the stories of nine individuals, the relationship between mind and body as it is mediated by the experience, or simply the terror, of being ill. And in an intimate investigation of those nine lives, it shows how the mind can make a prison of the body by distorting our sense of ourselves as physical beings. 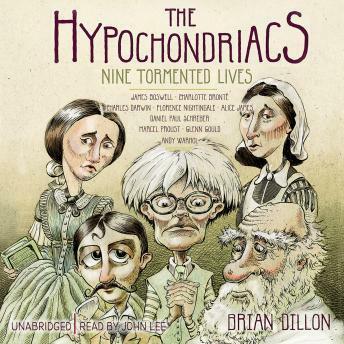 Through witty, entertaining, and often moving examinations of the lives of nine eminent hypochondriacs-James Boswell, Charlotte Bronte, Charles Darwin, Florence Nightingale, Daniel Paul Schreber, Marcel Proust, Alice James, Glenn Gould, and Andy Warhol-Brian Dillon brilliantly unravels the tortuous connections between real and imagined illness, irrational fear and rational concern, the mind's aches and the body's ideas.